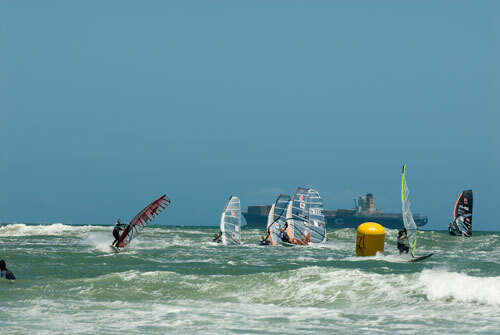 Today we had the last day of the IFCA Slalom Worldchampionships here in South Africa. 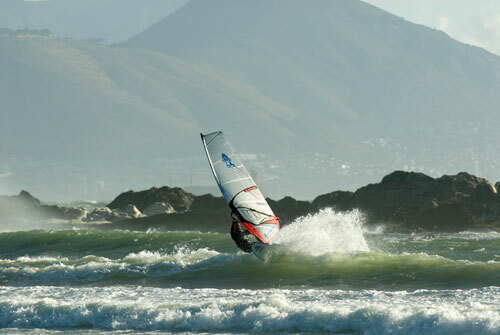 The races took place in Big Bay for the first time while this competition. It felt strange to sail at a new spot. I prepared very well today, rigged three sailsizes in 6,7 / 6,1 and 5,6. In the beginning while the warm-up and while the first 2 heats the wind was light, definitely too light for my 6,7. My bigger size 7,7 I totally ripped at Witsands break two days ago. So I had no choice. I only finished 13th in race number 4. Very disappointed! While elimination 5 the wind picked up. I could make it into the final and finished 2nd just behind the event winner Ben van der Steen. For sure it was one of my better heats in my career and I am so stoked. Overall I finished 8th in the IFCA World championships 2008. Later the day I went for a wavesession, which turned out to be fun. I used the EVO 75 2009 for the very first time and the Gator 4,7, a great combo.